Benton County posted this view of the inside of the jail on Facebook. The last time Benton County invited the public to come talk about its jail problems and I wrote about it, on June 11, someone in North Albany complained he wasn’t aware of any public invitation. So this time, here it is: You’re invited to come by what used to be the Spring Hill Country Club on Tuesday night, between 5:30 and 7:30. That future looks like this: In the general election Nov. 3, the commissioners most likely will ask Benton voters to approve a bond measure to build a new jail because the existing one is too small and falling apart. The sum of $20 million has been mentioned. The county has named two potential sites, a former mill property in Philomath and a parcel near the Corvallis Airport. The new jail would have space for 120 inmates and 12 more on work-release, the sheriff hopes. 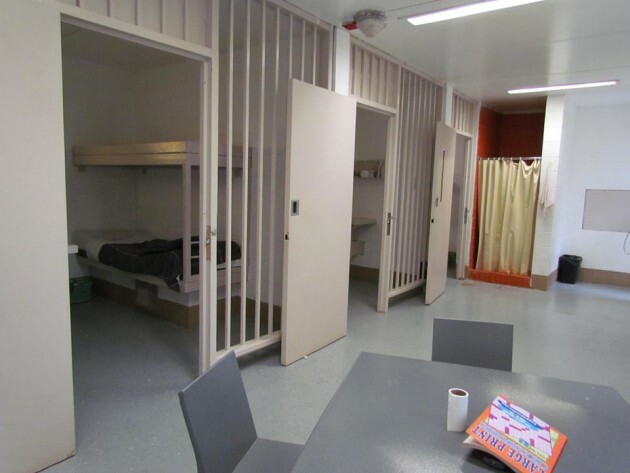 The current jail, at the Corvallis courthouse, can hold up to 40, and the county spends about a million dollars a year housing inmates at the jails in Lincoln and Yamhill counties. For North Albany taxpayers within the city limits, the Benton jail bond issue would be on top of the $18 million they’ll be paying off over the next 10 or 20 years for the new Albany police and downtown fire stations. (The bonds haven’t been sold, so I don’t know their amortization period.) It will also be in addition to the bond issue of still unknown size for school buildings that the Albany School Board is working up. That’s something to think about. The Benton County board has not yet placed its jail measure in the ballot, so county officials don’t have to worry about the electioneering law as they go all out to publicize the need for a new jail. The sheriff’s department has started issuing press releases whenever the jail has to refuse to lodge additional inmates because it’s full. The other day, the county announced the jail was “closed” for 14 hours. It wasn’t really closed, but it turned away officers hoping to lodge people they had arrested. The county also let the public know when a door handle failed on the jail’s administratuive office and a staffer was locked inside until somebody could get the thing fixed. For a jail only 39 years old, the outsider thinks, maybe the equipment ought to be kept in better shape. But there are many obvious problems with the place, including the lack of space and the style of construction. The walls leak, and the county has mentioned that the plumbing is situated so any blockage requires jackhammering into the concrete floor. I went to OSU from 1961-1965. My parents decided that I would be attending OSU vs Cal, Berkeley after they saw the cute little jail in Corvallis. They decided there certainly wasn’t much crime in Corvallis. The jail only had a few cells and, I believe, there were flower boxes outside the windows at the time.